The INFINITI Around View Monitor’s story started back in 2007 when it made its debut. This technology was innovative upon its arrival and thanks to updates to this feature, it provides even more peace of mind. Only select new cars & SUVs available at our INFINITI dealership serving Parsippany NJ come equipped with the Around View Monitor, but it’s an upgrade worth having. Before we explain why, here’s a quick preview of what functionality you’ll get. Cameras. Mounted on every INFINITI model equipped with the Around View Monitor are 4 cameras. Located on the side view mirrors, front and back of the vehicle, you’ll get a 360-degree view of what’s near your car or SUV shown on the in-dash display. Sonar Sensors. Placed on the corners of the front and rear bumpers, these sensors notice when there’s an object in your vehicle’s path. A warning indicator will show up in the in-dash display and an audible warning can be easily heard if your INFINITI comes too close to an object. Moving Object Detection. As the latest addition to this upgrade, Moving Object Detection will alert you to moving objects that are in front of, in back of & on the side of your INFINITI. You can also see the area where the movement is occurring on the in-dash display. Parking Lots. We’re sure that there have been times when you’ve been in a rush running errands and are excited to get home to rest after a long day of driving around. So, you might accidentally not look before backing out of your parking spot when there’s a cart in your way or even someone on their phone not paying attention to their surroundings. The technology helps you see what’s behind you in real time, so you can watch out for it. Driveways. You might be in a rush to work or a family activity. so the same unintentional mistake can be made here that we discussed earlier in the parking lot. By seeing and hearing the warnings, you can avoid running into balls, cats, dogs, young kids and more in your neighborhood. The City or Busy Streets in Your Town. Parallel parking can be scary if you don’t do it often. You might not have perfected it since your driving test. This technology can help simplify the process of parallel parking, so you’ll avoid hitting another car or driving up onto the curb. We feel that you’ll get a lot of use out of the Around View Monitor in the Morris County NJ area. Between where you live or travel and keeping your INFINITI looking as pristine as possible, this upgrade is well worth it. 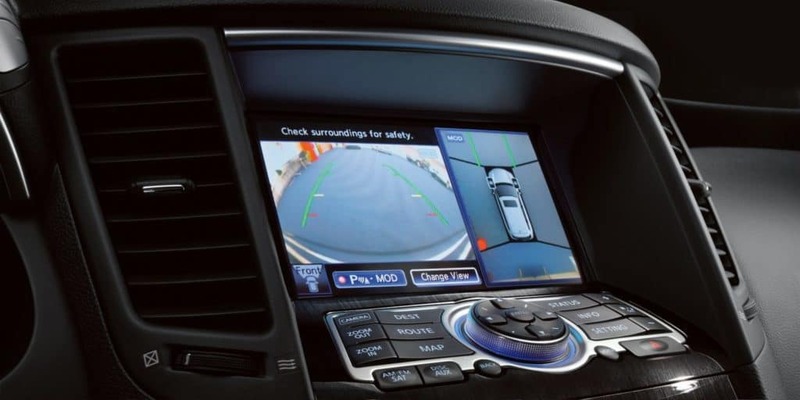 If you have any questions regarding the Around View Monitor and the new INFINITI models this upgrade is available for, please contact the experts at Salerno Duane INFINITI of Denville where we’ll help you drive home in the right vehicle to meet your driving needs.